Build a room and post a link to it in this thread. It can be big or small, fancy or plain, but it has to be just one room. I'll connect each room to the next and we'll end up (hopefully) with a big chain of rooms made by our members, that's it. Rooms will be added as they are recieved. I haven't decided if a standard connecting hallway and/or a standard portal enter/exiting should be used, or if we should really call it "Build a room plus a connecting hallway", lol. It includes a generic connecting hallway (I guess for now you decide if want to use it or not. As(if) maps are uploaded i'll compile the lot and post a link to the latest, complete version. If you submit a room and update it after it's been already added, simply submit a new link and i'll recompile with your latest version. My own room is not 100% complete as i have to add texturing, some effects and some moar detail. Hah , a coop project yes ! [EDIT2] What about halls ? Oh snap! I have been thinking about posting an idea like this but never got round to it. I'm so gonna do this...right now. No. Source is the devil's engine. Also, I'm assuming the entrance and exit door do not have to be on the same level right? EDIT: actually, compared to nearly everything. Face the truth. Even I do know to map a little for source I still love goldsource. 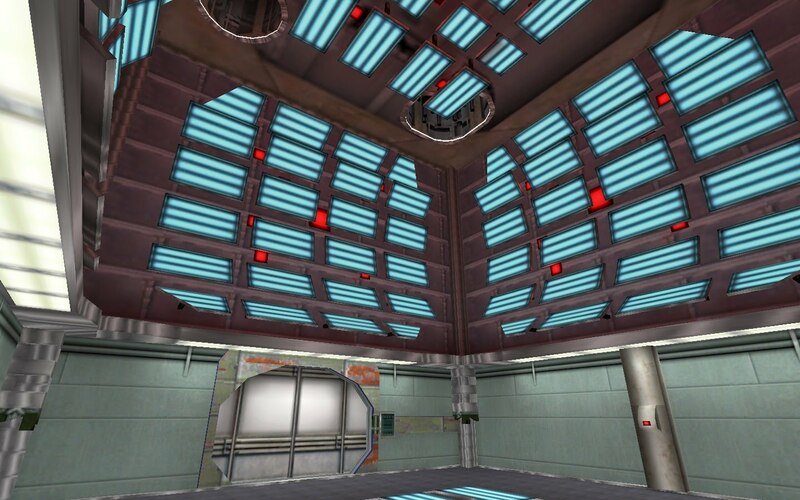 And most of the people on TWHL I think still love mapping for hl1. And if this thread is for goldsource, and you don't like it then make one for source. And then we'll see how many mappers will prefer source and how many goldsource. [EDIT] I noticed some change in your behaviour penguinboy in the last weeks or so ... I know I can judge nobody, but your posts are a little immature from my point of view ... is that because of the holidays ? It's worse than spam. Well I don't think anybody is going to read this , so strider if you have admin powers, delete your our posts. It's still discussion, albeit of a not-so-serious nature. Or, as we say in Britain, "Being particularly pissed." Only one room? Heh, even I can get a room done. Brilliant idea! Sadly I have no HL1 anymore..
..so I would love a Source version, then i'm in. Go for it, Strideh! Is it going to be a SP or MP map? Could we get the size of enter/exit doors? Or at least the size of the hallway connecting the rooms. Can we use Opfor textures too, or just HL? I'll make a room and wait until the answer to upload, incase I have to use HL textures only. I imagine its HL texts only. Aye, and it would be more fun that way. Sounds fun, maybe if I can tear myself away from my plethora of free stuff from over the holidays, maybe I'll join in. How about turning this into a competition? The one who makes the most interesting room wins. I'd be up for a source version! Okay... I need to upload my rmf and map... I'll go it tomorrow when I have enough energy to do it properly. I don't think I have any custom textures in it, though. dunno use the one provided or make you're own i guess. totally. someone who is good at source editing should host it, i'm a total source newb. yes and no. it's very limited but you can still do amazing things with it. plus my favourite plus about hl1 editing is everything is quick and easy to do. No gameplay intended so i suppose SP. I don't see why not but i don't want that to be the main focus of the thing. Keep in mind you can always update your room, so no reason to spend a million hours making it absolutely perfect the first time. K that's the last question(i think). Soooo... upload a room already! I'll do it. And I was thinking, not everybody is able to view maps from source, or goldsource, so would anybody try rekerjiggering some maps between engines? I'd do it myself, if I could do source. Seems like people are interested in doing it for both Source and Goldsource, nice. I'll work out some rules based on this one and shove a thread up shortly. I'll sticky them both too, until they're over. I like the whole idea. Who can make the best room? I don't know! EDIT: are their any rules besides it has to be a room? how about additional content like models and textures? or is it defaults only? Wuuuuuuuu....t? Why would you want people to wadinclude their textures? Wouldn't you need the RMF and the WAD anyway? Seems like you could just combine all the custom WADs when you're ready to do a final compile. Also, seems like it'd be a bit hard to standardize texture lighting, since I assume that's what most people are going to be using. Everybody would need to include their own lights.rad file and hope there aren't any conflicts with other maps. Multiple skyboxes could also be an issue, if anyone uses them. I like the whole idea though, just trying to help avoid any potential pitfalls. Yeah, i thought about these issues too. You should post your lights.rad file, what sky are you going to use, and other properties of global things like light_environment, etc. srry is right, there are things to think about with compiling and lighting. Skybox isn't necessarily a concern as long as our rooms stay as rooms. For custom textures, why not prefix them. Example: RIM_CRETE1A, RIM_REDLIGHT. Or if you really want to open up control, make each room an individual map. That way we can compile with our own settings and sky boxes. Just fill out a list of map slots so we all know the names of the maps we need to connect to As far as resources go, it would be like a big map pack rather than a single map loaded with stuff... Plus no one person needs to compile the whole thing when its done. I'll have my room done next week. Can we include traps, things like this ? Yeah, I want to know if combat is allowed as well. Looks like Strider-Man set the rules for the Source version pretty well, we need something like that here. Mine's done. Should'nt add to the compile time or playing strain of the master map by much. I also did'nt add a door because I wanted the outside to match whatever theme you have for the halls. Oh, there is a vort, but it does'nt attack you... It's taking my place in the room. Damn, that sure was fast. Mine's a bit bigger. I hope it's not too big. WAIT! WAIIIT! I NEED TO ADD MORE TO MY ROOM! DON'T PUT IT IN YET!!! DON'T LISTEN TO HIM. HE'S EVIL. are their any rules besides it has to be a room? how about additional content like models and textures? or is it defaults only? 3. if somebody has a better idea or variation of what we should do please speak up and we'll go by the best suggestions. Use spirit for the sky issue? I dunno enough about spirit to know the answer to that. would everyone need spirit installed and can you teleport from a spirit map to a regular map? sure, just remember it has to be one room and one room only. edit: i'll look at the source version rules srry mentioned and we'll probably adopt them? editx2: I just looked at the source rules they sound good, just upload your map with everything i need including source file, lights.rad and gfx, wads etc whatever you use. Maps i can connect without teleports i will do so, and i'll only use teleports as needed... take each map on a case-by-case basis i guess. how does that sound? 1. rooms must have one entrance and one exit. Can the entrance and exit be one thing? Urban: you can have those things but they cannot be accessible to the player: i.e. you can have windows looking out to an external area but the player can't walk out there. you can have closets but put something in the way so you can't enter it. Even if you're original idea won't work why not submit a room anyway? (aw i was excited when you said you'd enter) What was your original idea? Processed in an awfully sarcastic 95 milliseconds.